The world wasn’t exactly clamoring for a belated sequel to Roland Emmerich’s ’90s disaster movie par excellence Independence Day, and especially not one that skimps on the colorful mass destruction and delivers only the first half of a plot, teasing more to come. But Independence Day: Resurgence deserves credit for at least putting some effort into realizing a post-alien-invasion Earth. Set in a militaristic alternate present enabled by reverse-engineered alien technology, Emmerich’s follow-up to his 1996 signature hit is much more of a pulp sci-fi movie than the original, complete with dashing space pilots, psychic African warlords, and moon bases. Fun as it might be to watch Germany’s premier exponent of conspiracy-theory-inspired big-screen annihilation channel his inner James Cameron, Resurgence ends up falling victim to its attempts to differentiate itself while remaining completely derivative. Twenty years after city-sized flying saucers arrived to wipe out humanity, only to be defeated by a Macintosh PowerBook, the Earth is in a state of nominal peace. 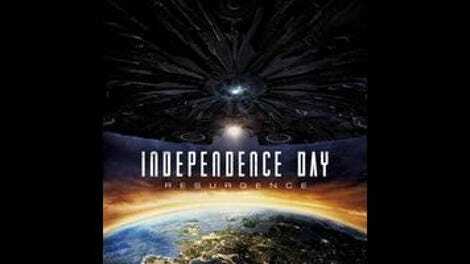 Its efforts are now directed toward global defense and its disproportionately young population—either orphaned by the invasion or born in the repopulation boom—has been raised to view Independence Day’s cast as something like demigods. Shrewdly, the screenplay (credited to five writers, including James Vanderbilt, who once upon a time wrote Zodiac) hints that the original’s America-centric rah-rah populism wasn’t all it was cracked up to be. Given Emmerich’s tendency to borrow from other ’90s big-budget sci-fi movies—including an opening sequence in which Independence Day’s climactic speech makes its way through space, riffing on the beginning of Contact—one almost wishes that the movie would go full Starship Troopers with its premise. Massive spacecrafts sit untouched in central Africa, where fighting against the aliens—slimy squid-headed things encased in hulking exoskeletons—continued for another decade after victory was officially declared. Descendants of invasion-era heroes join “legacy squadrons” and are trotted out for photo ops. Area 51 now houses a prison for extraterrestrials. Survivors of the invasion and its aftermath bear deep psychic scars from their extended exposure to the aliens’ telepathic communication. President Thomas Whitmore (Bill Pullman) is now doddering and prematurely old, looked after by Secret Service agents who make sure he takes his meds; Dr. Okun (Brent Spiner), the Area 51 scientist who served as a telepathic intermediary to a captured alien, has been in a coma ever since; and Will Smith’s Capt. Steven Hiller is a widely venerated Gagarin figure, having perished in a test flight. As feared, the aliens return just in time for a global celebration of the 20th anniversary of their defeat—this time in a 3,000-mile-wide mothership whose gravitational pull briefly lets Emmerich show off his unparalleled knack for staging eye-popping, large-scale destruction. 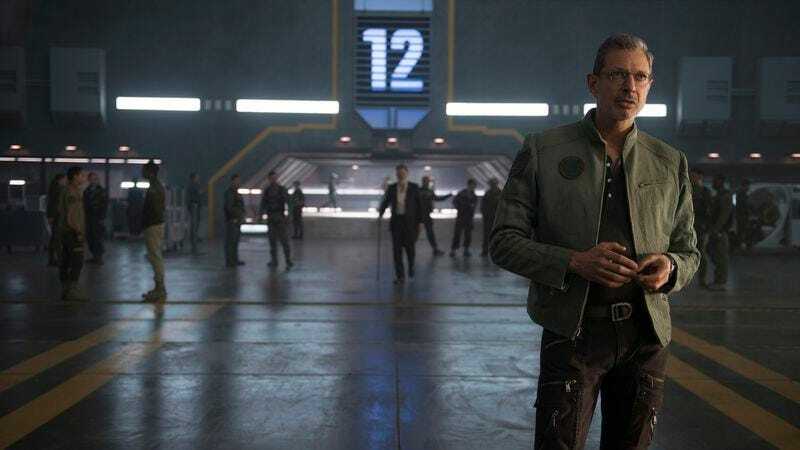 Before that point, Resurgence is basically a future-tech adventure flick, with cable-repairman-turned-global-advisor David Levinson (Jeff Goldblum) joining Dikembe Umbutu (Deobia Oparei), the machete-wielding leader of the self-styled Republic Of Umbutu, and Catherine Marceaux (Charlotte Gainsbourg), an alien-telepathy specialist and former flame, on the hunt for clues. They’re ferried around on a Cameron-esque “space tug” by Jake Morrison (Liam Hemsworth), fiancé of Patricia Whitmore (Maika Monroe) and archrival of Steven Hiller’s son, Dylan (Jessie T. Usher). Lacking a charismatic movie-star lead in the mold of Will Smith in the original film, Resurgence is able to zip along for its first act by simply introducing new environments, technologies, and soap-opera-ready relationships at a steady clip. But then comes the protracted climax, one long air battle that devolves into a kaiju-style giant monster attack in the Bonneville Salt Flats. (At least it’s better than Emmerich’s Godzilla.) Aside from the aforementioned mothership arrival—which gives the director another pass at the “overturned toy box” extravagance of 2012, a third go at destroying the (conveniently rebuilt) White House, and a chance to ram the Petronas Towers through Tower Bridge—and a bit character inexplicably styled like Che Guevara, Resurgence mostly avoids those mishmashes of instantly recognizable pop-culture iconography that have always been Emmerich’s forte, playing as straight action sci-fi instead. The director’s stubborn commitment to the look, sound, and cornball humor of ’90s blockbusters has its virtues. It’s rare to see a movie this expensive and visually clear, emphasizing every special-effects vista for maximum oomph, regardless of whether audiences might still be impressed by spaceship interiors big enough to support their own ecosystems or panoramas of cities rebuilt with futuristic technology. But today’s business model of preemptive franchising ends up getting the better of Resurgence. The movie’s dips into all-out space opera (interstellar travel, more alien species, etc.) are only meant to get the audience pumped for a movie that doesn’t yet exist, making the undistinguished climax seem like a skirmish. The fact that it mostly rests on the shoulders of the younger cast—either wasted or given too little screen time early on to matter—doesn’t help. For thoughts on, and a place to discuss, plot details we can’t reveal in this review, visit Independence Day: Resurgence’s Spoiler Space.